When Yahweh has spoken something directly to you, that should SETTLE IT in you, (if you believe Him). Quit seeking out 10,000 prophets or people, for a word that Yahweh has already given you. If God said it, then that settles it. Yahweh says, where is your faith in what I say, alone? When did my WORD NOT BECOME GOOD ENOUGH FOR YOU? Take ME at my WORD and my WORD WILL TAKE YOU TO WHAT I HAVE SPOKEN OVER YOU. All it takes is faith, God doesn’t respond to your emotions, but responds to your FAITH. Stop shopping for what’s already in your spirit, and in your hands. He already paid for it, he already made provision, and he has already brought it to pass. IN GENESIS CHAPTER 1, everything that GOD SAID, AND GOD SAID, AND GOD SAID, and eventually, GOD SAW, WHAT, HE, SAID. 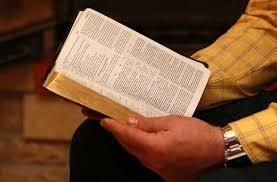 STAND ON GOD’S WORD, IT IS THE MOST SURE WORD OF PROPHECY AND UNCOMPROMISING FOUNDATION. RELY ON, TRUST IN, BELIEVE ON, LIVE TO, REST IN, SLEEP ON, CONVERSE ABOUT, AND CONSUME HIS WORD TODAY! Amen, and again I say amen! Best meal ever is God’s Word! Indeed! That was truly profound what you posted. It really blessed me. Good to know it blessed you, Carla! I love God’s timing! I just sent my book “Eat the Word: God’s Diet Plan for your Soul” to the publisher today for the final edit! Praise God! God’s Word is the best diet ever! Congratulations on your book. Soul food, that should be consumed daily! Amen, well said! Yep, true. He’s THE authority. The ONLY authority. His Word is final – period. True! The Word is truth!